You like waffles? You like burgers? Then why not put them together? So I had to try the Griddy Burger ($8.90) at Griddy Gourmet Waffles at Westgate in Jurong East. I loved it. The meat was fresh and juicy with the mushrooms giving it an added texture. Surprisingly, for a place named after its "gourmet waffles", the weakest part of the burger was the flaccid waffle which seemed like an afterthought. But the overall result was a winning mix of sweet and savoury. My friend ordered the Ocean Catch and said the same thing, although I was rather put off by the overdousing of mayonnaise. 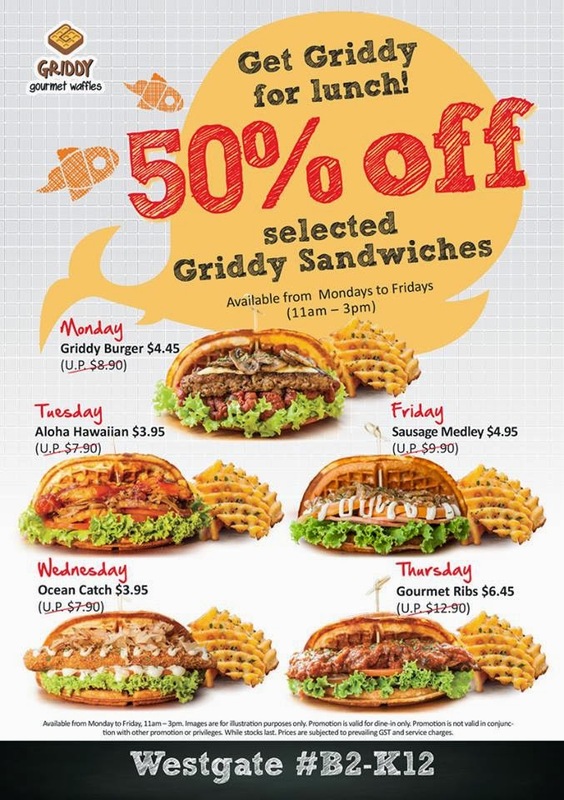 Starting this week, Griddy is offering half off on selected sandwiches for lunch on weekdays. I really want to try the Gourmet Ribs, which is the most expensive. I had a little trouble finding the place the first time because I was unfamiliar with Westgate which opened only late last year next to the more infamous Jem. 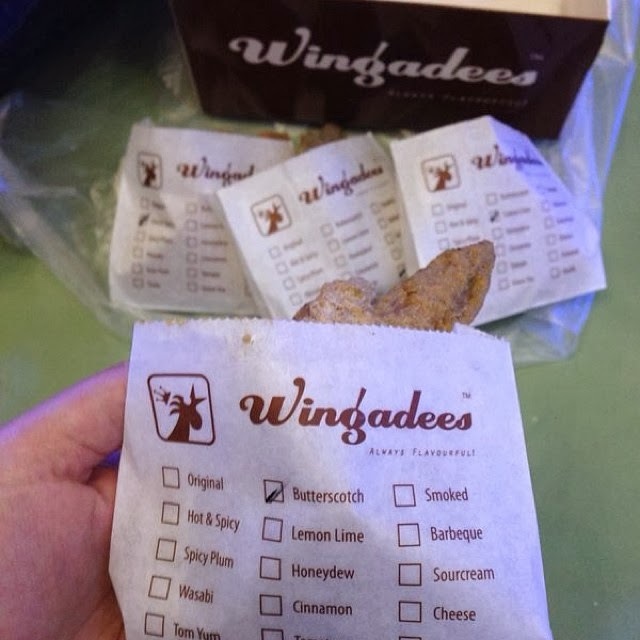 Another new food place I discovered at B2 was Wingadees, which is like the local Baskin Robbins of chicken wings, offering up to 20 flavours of fried chicken wings from savoury to spicy to sweet. The more intriguing flavours are butterscotch, vanilla, honeydew and green tea. I bought six wings for $10. 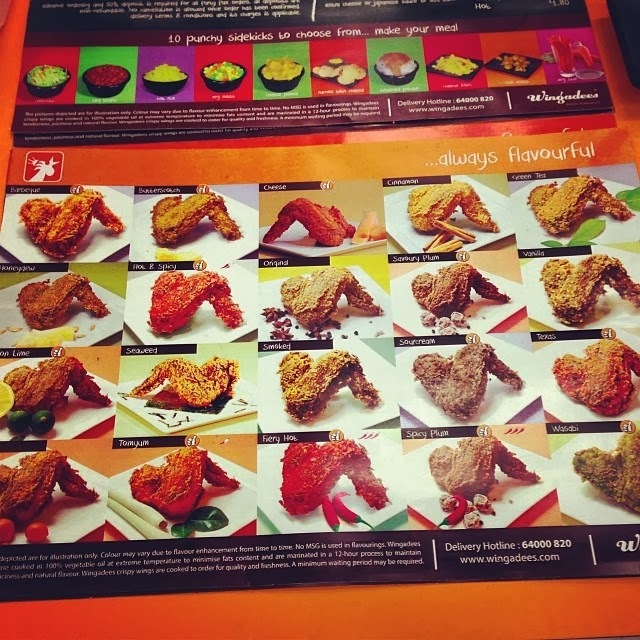 The different flavours did make things interesting, but the wings themselves weren't as well-cooked as I hoped. I do appreciate that the wings are individually packed and labelled to take out the guesswork of what flavour you're eating. Still, it's no waffle burger. UPDATE: Sadly, Wingadees has closed, but Griddy's business seems to be getting better. The 50% off lunch promo is over.